With more than 4670 police jobs open for recruitment, candidates aspiring to join police and paramilitary force of the country can now fulfill their dream. This is a great opportunity for 10+2 pass police job aspirants. Joining police paramilitary force will not only give you a chance to serve the nation, but will also give rise to a sense of responsibility to maintain the law and order of the society. As a police person you will harness the trust of the common denizens for the overall personal as well as social betterment. Uttar Pradesh Police has announced for 3789 vacancies in Jail Warder and Fireman posts. 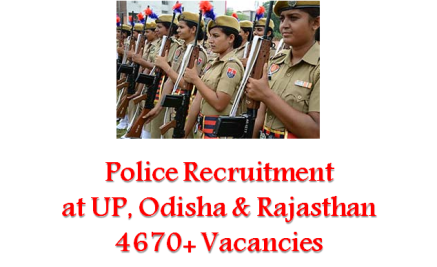 Similarly 655 vacancies have been declared by Odisha Police and Odisha Staff Selection Commission for Constable and Sub Inspector posts, respectively. A total of 233 vacancies (SI/ASI posts) are open for recruitment at Rajasthan Police. Candidates should note that for ASI posts the eligibility criteria varies as per the trade/ discipline required. Candidates are therefore suggested to not just throw an overall glance on the notifications and read it properly before applying.